Not long after Wilmot�s experiment, authorities arrested her and charged her with �possession/discharge of a weapon on school property and discharging a destructive device,� according to WTSP-TV. The school district proceeded to expel Wilmot for handling the �dangerous weapon,� also known as a water bottle. She will have to complete her high school education through an expulsion program. Friends and staffers, including the school principal, came to Wilmot�s defense, telling media that authorities arrested an upstanding student who meant no harm. Common sense seems to be the missing ingredient here. Let's ensure that students fear the experimentation that success in STEM requires and penalize them for scientific inquiry...no thinking or education allowed? Nope no thinking is allowed, and certainly no mistakes. What dumba$$es. The girl was plainly demonstrating what can happen with chemical mixtures. She should get an award. A felony charge could ruin this young womans life. Apparently this was just an accident and the prosecutor should drop all charges. Just an accident, no person was harmed, no property damaged, no intent to cause harm. This prosecutor is over reacting and could harm a this young girl for life. What was it- vinegar and baking soda? Been there and done that. The fact that is was a girl and that it was science will surely not play well in Conservativeland. Who hasn't done that once, and been embarrassed at the results? Though happily I was not arrested for making a common mistake. We tell our students that they will learn from trial and error, what are we teaching these students? Make a mistake and go to jail? Like Kit said, most of us have done experiments like this one, and many of us made mistakes doing so. How many of us were arrested for doing so? Another way to keep females out of Science! :( Next they'll claim she was using bad Math! ;) This is just plain Stupid - authorities cannot prove criminal intent, Period! This is really serious, not like giving 5 year olds guns. Thank you for sharing her story. Once again racism rears its ugly head..
Heard about this - ridiculous - I remember when I was in junior high and some kid accidently blew up the science lab - that was life. I read about this yesterday, Kit, and I couldn't believe how outrageous this charge is. The reaction is so out of proportion I agree with the idea that the reaction must be based on race. Whether it is from a racial or gender bias or just a mentally constipated school administrator, the results of this arrest will not be lost on students thinking about science experiments. Please do consider offering your signature to support young Ms Wilmot. Isn't that where we are suppose to learn and experiment, in school? Guess we'll have to take Science out of the schools, can't have the students ending up in jail. Such a punitive society, people must pay over and over and over again for small mistakes. Even those who do years in prison and complete their time and has changed their lives around, we never give them a chance to get back on their feet. But to destroy a young girls life like this before she gets going over something so so minor is criminal on the adults part. There is no common sense being used in this Country anymore. With this scare tactics after 9-11 no one uses the brain matter that was gifted to them. Like robots they march to the beat of the Corporate Gods. Another is being primed to eventually fill the bed in the prison system for someone to make money off of. A very punitive society, with a vengeance. This is wrong. I have signed on Care 2 about this. The teacher should have said what to do, and what not to do. It's wrong to punish a curious and bright girl. A very significant part of learning science is the curiosity and making attempts at something. When I was in high school the chemistry labs were on the third floor, still people heard explosions down on the first floor. Our country was different back then, people were not salivating over who was next on the chopping block, students were encouraged to learn and even make mistakes. Yeah, making mistakes can help us learn, and her curiosity just shows that harsh household chemicals are not good! Many things in the "household cleaner" group can do far worse, but often a list of "do not use" is given by teachers. I give her an A for trying. Oops! Another petition on Change.org to support Kiera Wilmot. OMG if this young woman is being charged for this my son would have been in prison by the time he was her age. He experimented with everything and ended up a mechanical engineer but based on his teen years I would have sworn he was headed for prison. Come on Florida this is just WRONG. Thank you Kit. Conservativeland, is not interested in having people think, in fact that idea is anathema to them; just shut up and get into the goose-step line! So this young woman is being slapped with felony charges for a lapse in judgement? Extremely unfair when our government officials commit the same crime every day, and with far more dangerous results! We learned : "Chemie ist das was knallt und stinkt, Physik ist das was nie gelingt"
loosely translated: chemistry is what bangs and stinks, physics is what never succeeds. An A from me as well for her! This is unbelievably outrageous, a "weapon"????? Petitions signed of course, thanks. I sure hope they will go against that and have her record cleared again. Racism+ stupidity+war on women+war on education. A tragedy, really. Noted...thanks Kit. This is exactly the kind of knee-jerk reaction, and the injustice that necessarily happens when those in authority think that the letter of the law is more important than the spirit of a law. That kind of thinking completely dismisses common sense from dictating, and cooler heads prevailing. Thanking those who signed the petition! Kit who posted the story. Nearly 200,000 people signed an online petition protesting her arrest, and her name trended on Twitter for a few days. 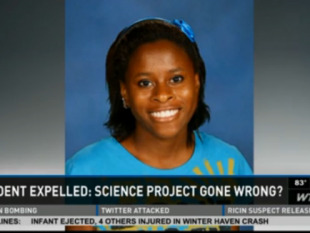 Several heavily trafficked websites wrote about her case, saying that she shouldn't face felony charges for a science experiment gone bad � and that an arrest in the case sent the wrong message to budding scientists. Other columnists felt that Kiera was treated harshly because she is black � and that a white student doing a similar experiment wouldn't have been handcuffed and arrested. Thanks for the update, Dandelion. I'm so glad that Kiera wasn't charged. Still, it is odd to punish scientific curiosity AND complain that kids aren't interested in STEM education. A central Florida teenager who was accused of igniting a chemical explosion on school grounds � and who became the subject of a grassroots social media campaign on her behalf � will not face criminal charges, authorities said Wednesday. Polk County State Attorney Jerry Hill wrote in a statement that the case against 16-year-old Kiera Wilmot has been dismissed, but that she must complete a diversion program. The teen was arrested April 22 and faced possible felony charges after school administrators reported she combined toilet bowl cleaner and aluminum foil in a bottle, and the resulting gas blew the cap off the plastic bottle, according to the police report. The explosion happened outside, before school started, and no one was injured. Kiera told Bartow police she was doing a science experiment, but science teachers said they had no knowledge of an experiment. "Based upon the facts and circumstances of the case, the lack of criminal history of the child involved, and the action taken by the Polk County School Board, the State Attorney's Office extended an offer of diversion of prosecution to the child," Hill said in the statement. "The child and her guardian signed the agreement to successfully complete the Department of Juvenile Justice Diversion Program." Details about the program aren't public record because Kiera is a juvenile. The teen's arrest launched an outcry on social media by people who thought the arrest was unfair and heavy-handed. "With this type of thinking is it any wonder Black and Latino Children are under-represented in Science Fairs," wrote DNLee, a biologist and popular blogger for the Scientific American website. "If everyone around you has the idea that only legitimate science experiments are those sanctioned and prescribed to students, then when are students expected to explore independent authentic science interests? In Bartow, Florida, I guess the answer is no." Brian Haas, a spokesman for the state attorney's office, said the massive online support for Kiera had nothing to do with the decision not to prosecute. "Not one bit," Haas said. "It's certainly something we were aware of. We looked at this like we would any other case involving a juvenile. We don't evaluate and make decisions on our cases based on what's being said on the Internet." Kiera's attorney, Larry Hardaway, said on Wednesday that the teen and her mother are relieved � but that they are still negotiating with the Polk County School Board regarding Kiera's academic future. Hardaway said that Kiera is worried that people at the school think she's a "terrorist" and is eager to clear her name there, as well. After the incident, she was suspended for 10 days. She has been attending classes at an alternative school in the district. Bartow High School Principal Ron Pritchard earlier had recommended her expulsion for a year, based on the district's Code of Conduct. That recommendation was put on hold until the criminal allegations against her were resolved. School officials said the case will go before a School Board hearing officer now that the criminal proceedings are completed. "We look forward to resolving all of the issues," Hardaway said. Thanks Dandelion for giving this update. I still have a few questions, what is a diversion program, how much if not all will be on her permanent record? Where is the formal apology from the school district?